As a fellowship trained Eyelid Specialist with over 20 years of experience, Dr. Deborah Sherman is uniquely qualified to treat ectropion and entropion. Because the eyelids are her only specialty, she has expert training and skills to perform delicate surgery of the eyelids. Dr. Sherman has extensive experience and a long track record of success with ectropion and entropion. The supporting structure of the lower eyelid may be likened to a hammock, with an inner layer of a cartilage-like element (tarsal plate), that gives the eyelid stiffness and helps the eyelid stay in proper position so it functions normally. Each end of the eyelid hammock attaches by two tendons to the bone on either side of the eye. If these tendons become too loose, the eyelid may turn outward or inward. Ectropion is when the eyelid turns outward, and can cause excessive tearing or dryness and irritation of the eye. Entropion is when the eyelid turns inward, which can cause the eyelashes to irritate the eye. Ectropion occurs mainly in older adults. If the tendons become stretched due to wear-and-tear (i.e. excessive eyelid rubbing), from trauma, or even other facial surgery, the lid may lose its normal position and sag outward away from the eyeball. 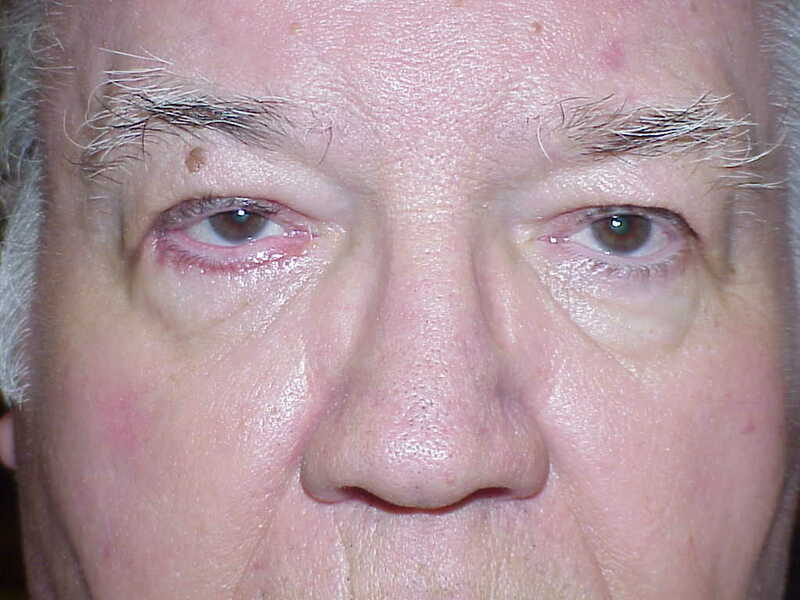 In severe ectropion, the entire length of the eyelid is turned out. When ectropion is less severe, only one segment of the eyelid sags away from the eye. Note that before surgery, the lower eyelid is stretched outward away from the eye, causing irritation. After ectropion surgery, the lid is in more comfortable and natural position next to the eye. Wind and dust may dry out and irritate the delicate tissue lining the back of the exposed lid. Tearing develops when the tear duct drain opening on the edge of the eyelid falls away from the eye and can no longer adequately drain the tears. Eventually, the eye may develop scarring, which can affect vision. The left lower eyelid margin hangs outward away from the eyeball, causing eye irritation. After ectropion repair, the eyelid margin is restored to its normal anatomic position, reducing tearing and improving overall eye comfort. Irritation. Stagnant tears or dryness can irritate eyes, causing a burning sensation and redness in the eyelids and the whites of the eyes. Excessive tearing. Without proper drainage, tears may pool and constantly flow over the eyelids. Many people with ectropion complain of watery or weepy eyes. Excessive dryness. Ectropion can cause eyes to feel dry, gritty, and sandy, which increases the risk of infections. Artificial tears can help relieve the symptoms caused by ectropion until surgery to correct the condition. Ectropion surgery is designed to tighten the stretched tendons in order to reposition the eyelid in its normal position. However, in some patients, additional tissues may be used to provide a new means of support so that the eyelid is positioned properly and performs its function. On the left slide, note the lower eyelid position is in a downward position, so loose that it cannot hug the eyeball and keep it moist and adequately drain the tears, so the patient feels irritation and dryness due to exposure to the air and tears excessively as the tear drain or puncta is not in position to allow the tears to drain normally. On the right slide, note that after Ectropion surgery repair, the lower eyelid is now in normal position, hugging the eyeball, providing proper moisture to the eye. Because the tear drain or puncta is positioned adjacent to the eyeball, it is able to drain the tears in a normal manner. Thus, the patient’s symptoms of dryness and tearing are revolved. If you know that you have ectropion, be alert for symptoms of cornea exposure or ulcers, including rapidly increasing redness, pain, light sensitivity, or decreasing vision. If you experience any of these vision-threatening signs and symptoms, seek immediate eye care with a trained professional in eye care, such as your Ophthalmologist, Optometrist, or Ophthalmic Plastic Surgeon. Note the medial eyelid near the tear drain is pulled away from the globe, preventing the tear drain to function. This causes severe tearing, which blurs vision. After punctual ectropion repair, the lower eyelid margin is in a normal position, allowing the tears to drain properly. The tearing is therefore resolved. The left lower eyelid margin is turned inward, causing eyelashes to actively scratch the eye. After entropion repair and repositioning of the eyelid, the eyelashes no longer scratch the eye and the pain is resolved. Like ectropion, entropion develops from a weakening of eyelid support system. As we age, our eyelid tendons may loosen, similar to the elastic becoming loose in the waist band of pants, causing the eyelid to become lax and floppy. When the eyelid tendon band looses it’s elasticity, the horizontal laxity increases such that the eyelid may turn inward, causing the eye lashes to rub and scratch the front surface of the eye, which is painful and increases the risk of serious corneal infections. Pain from the lashes and skin rubbing against the cornea can be severe, and the risk of damage to vision is immediate. Surgical correction for entropion entails rotating the lid margin back to a more normal position by tightening both the canthal tendons and the tendon-like sheath. Rarely, entropion affects the upper eyelid; in this situation, grafting of tissue from donor sources is generally required. This patient has eye pain in both eyes due to bilateral entropion. After surgical repair, the eyelashes no longer scratch his eyes, and he is much more comfortable.